LITTLE ROCK, Ark. (AP) — A man who is suing the Little Rock Police Department for blasting his door down and raiding his apartment without probable cause during a drug raid said Monday that he feared for his life. Roderick Talley recalled during a news conference how police used explosives to enter his apartment last August in an ultimately unsuccessful search for cocaine. Talley’s lawyers allege police violated his rights against unlawful search when they obtained a so-called “no-knock” arrest warrant under falsified pretenses. They also say police used misleading, if not false, justification for dozens of other unlawful drug raids, mostly against black residents. In an affidavit officers filed to search Talley’s apartment, police say they sent an informant to Talley’s door with $100 to buy cocaine. The three officers said they “observed the door open” and saw the informant have a conversation with someone in the apartment. Later, the affidavit claims the informant explained that he purchased cocaine from two black men at Talley’s address. But footage from a security system Talley had recently installed showed that Talley’s door never opened. Talley says he was at work when the informant rang his door, stood outside for about a minute and walked away. Nonetheless, the officer signed the affidavit claiming he saw the conversation occur. Police obtained a warrant, and six days later just before 6:30 a.m., they raided Talley’s apartment. The search warrant inventory shows police found a “green leafy substance,” digital scales, plastic baggies and “paperwork,” but no cocaine. Video footage from inside Talley’s apartment on the day of the raid shows his apartment door exploding from the wall and flying onto Talley, who was lying on the couch. At least 11 officers walked through Talley’s door shouting commands as Talley screamed fearing for his life, he said. 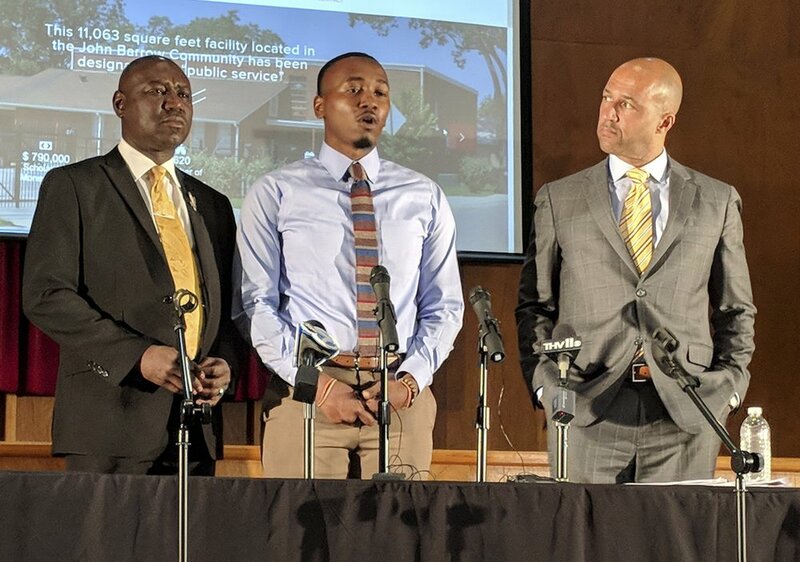 Talley’s lawyers Michael Laux and Ben Crump said they believe that the narcotics division of the Little Rock police engaged in a pattern of racially discriminatory enforcement through their use of “no-knock” arrest warrants. Because officers must knock and announce themselves when they intend to serve out a search warrant, a “no-knock” warrant requires additional justification. Laux and Crump said officers used boilerplate language on most of the 133 “no-knock” warrants, of which 110 were for black citizens, Talley obtained through a Freedom of Information request. Laux said he believed fewer than a dozen of those warrants used language other than what he called the “egregious” cut and pasted justification. Laux and Crump said many of the raids, in which police used explosives to blow up doors, turned up nothing. They also say the residents were left to pay for the damages. Additional footage from the raid shows police officers asking Talley to show them how to watch the explosion on his security system. After he shows them, the officers film the footage on their cellphones, laughing as they watch. Talley said he was frightened but knew that his internal security was still recording. But because officers told him they never got to see the explosion from the inside, Talley realized police had likely conducted these types of raids before. He complained to the department’s internal affairs about the officers who signed the false information on his affidavit, but nothing came of it, Talley said. He began searching for people who he thought might have been wrongly accused by police. Without a lawyer, he requested affidavits and signed search warrants from the courts and filed his own lawsuit before ultimately finding legal representation. A city spokesman says Little Rock police fully comply with state and federal civil rights law, while a spokesman for the police department did not have a comment. Talley’s lawyers said that his actions do what people would like to do but often can’t: use video evidence to prove police misconduct. “If he hadn’t had that camera, he’d be in an orange jumpsuit right now,” Laux said.